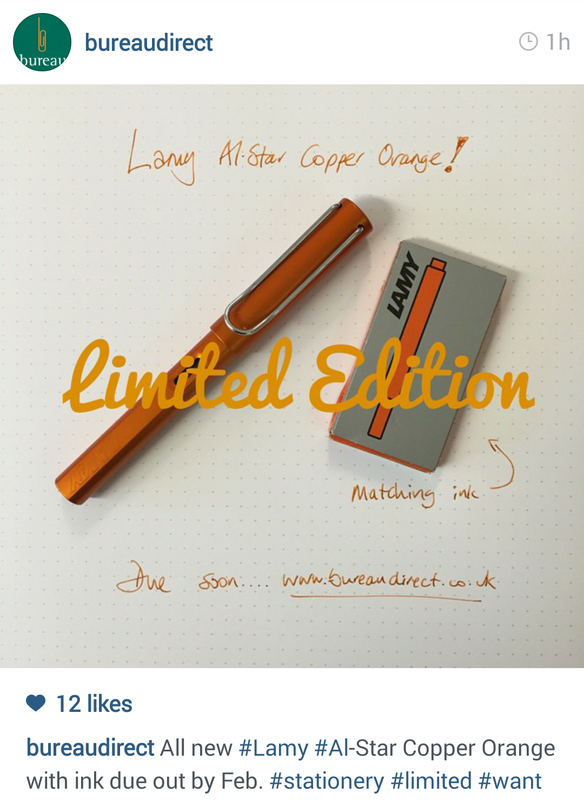 Limited Edition 2015 Lamy Al-Star Copper – More Pics to Drool Over!! 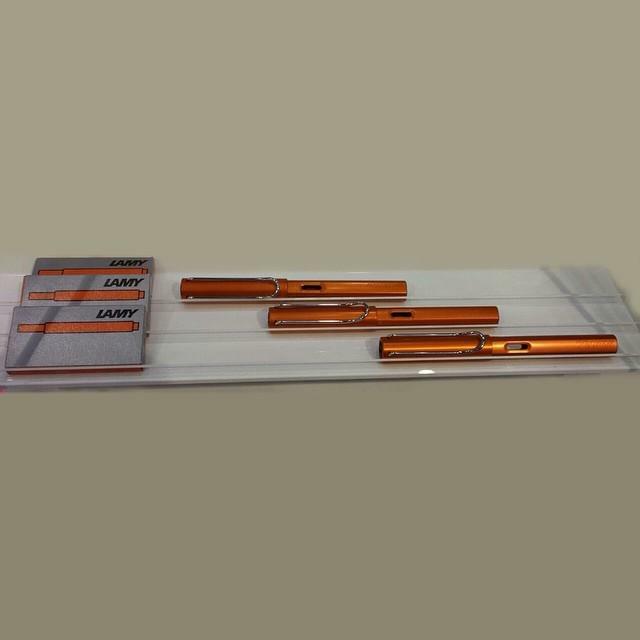 Real-world pics of the droolworthy 2015 Copper Al-Star, thanks to Appelboom Pens‘ Instagram post!! Seriously, how AWESOME does this color look!? 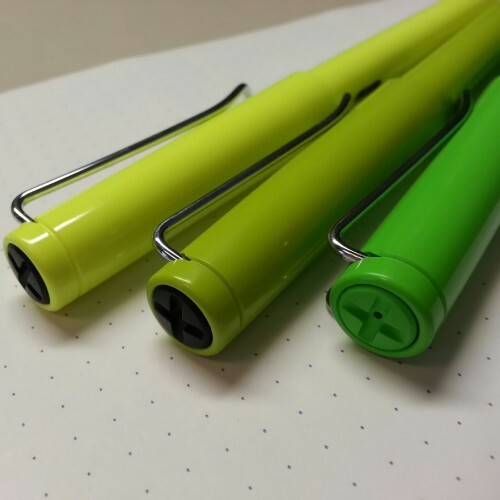 Limited Edition 2015 Lamy Safari – Neon Lime Green. Seriously? Does this color look awfully familiar to you? In this pic from left to right: my Neon Yellow, Lime, and Apple Green Limited Edition colors. “Neon Lime Green”? It sounds awfully close to the 2008 LE Lime Green. So, all in all, disappointing news. Especially when Lamy fans have been pining for a purple Lamy for YEARS. Will I get the 2015 pen anyways? Yeah, probably. Who knows, I was skeptical about the Neon Yellow and Neon Coral too, and ended up loving them. 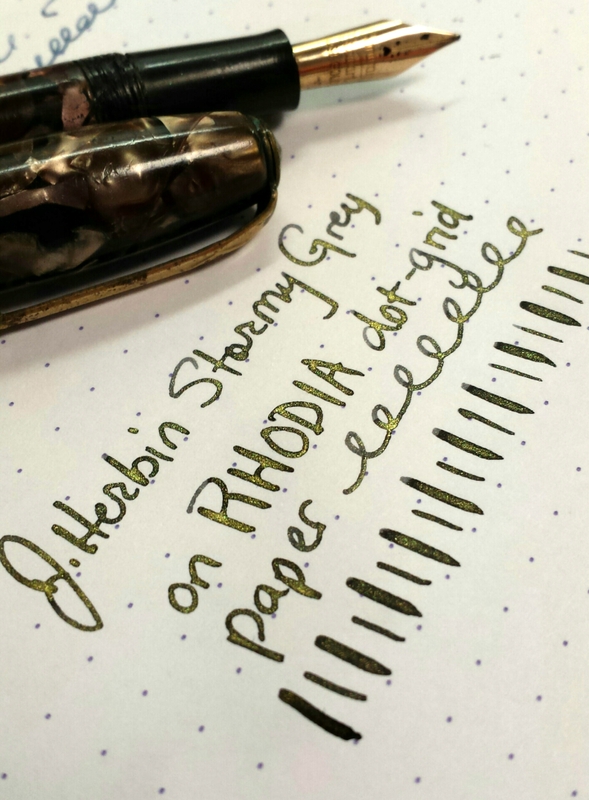 Awhile back I received a sample of the much-talked about J. Herbin Stormy Grey ink from an Instagram friend, and was SUPER excited. 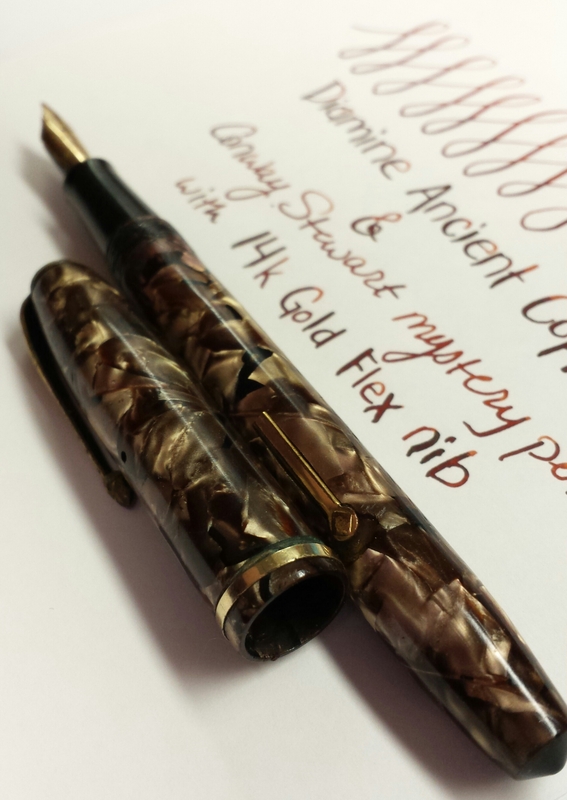 But once I loaded it up into a couple of different fountain pens, I wasn’t able to see the legendary gold flakes. It was so disappointing, but I came to the conclusion I didn’t have a nib broad enough to really take advantage of the ink. So I put it aside until I was ready to try another pen. And then recently met up with close friends for dinner and geeked out about some pen stuff, and my friend offered to lend me her vintage flex fountain pen to play with a bit. She had bought it off of ebay awhile ago, and it wasn’t in stellar condition, but worked if I wanted to try it out. And I was like, HELLS YES. 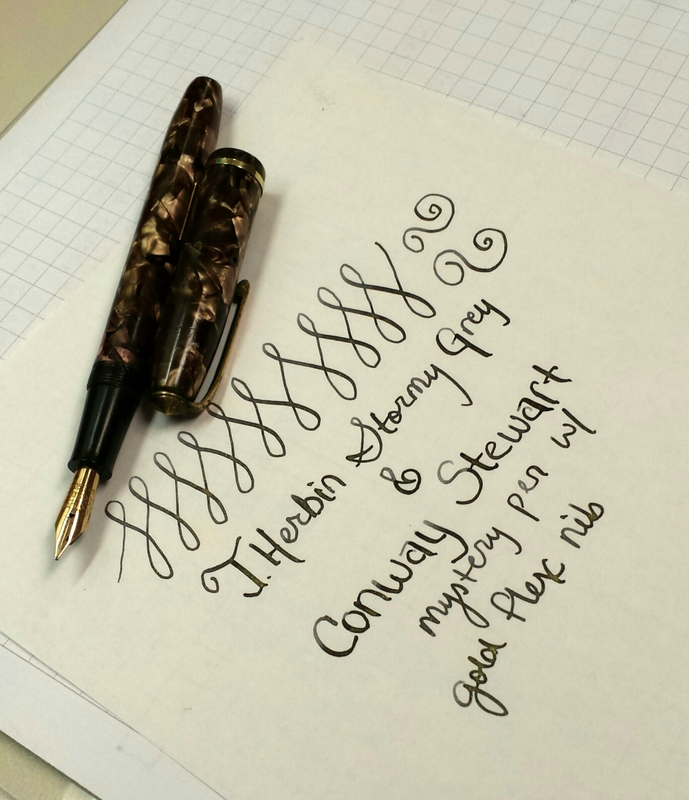 My friend couldn’t remember the type or name, but after some Googling it looks like it might be a Conway Stewart 75. 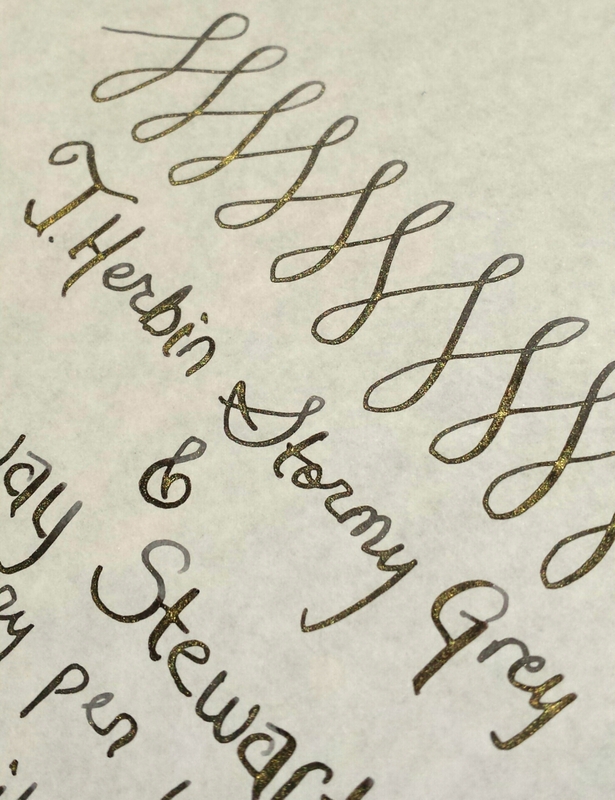 First I inked it up with Diamine Ancient Copper – not having ever used a vintage pen before, THAT was an experience! Trying to pull out that little lever, and fill up from a bottle … vintage pens are complicated! 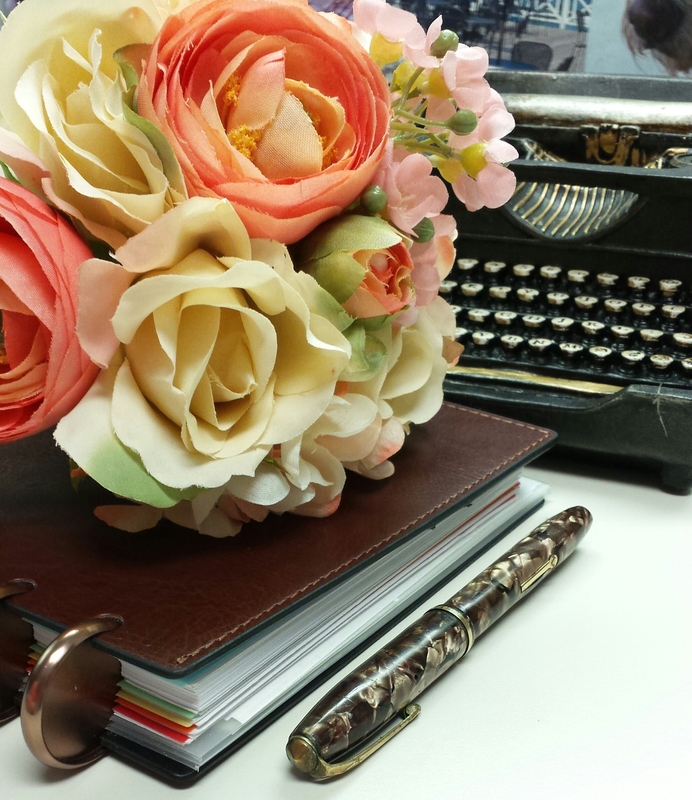 Initially I thought the pen was kind of an ugly brown…. but it kinda grows on you. The Diamine Ancient Copper leaves some ink crud around the nib though, so I cleaned it out (another interesting experience!) 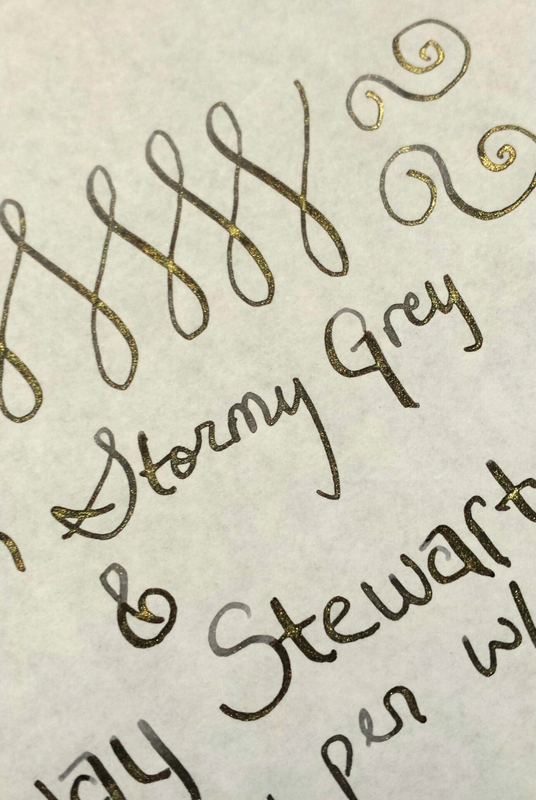 and tried the infamous J. Herbin Stormy Grey sample. AND OMG I SEE THE GOLD FLAKES NOW! 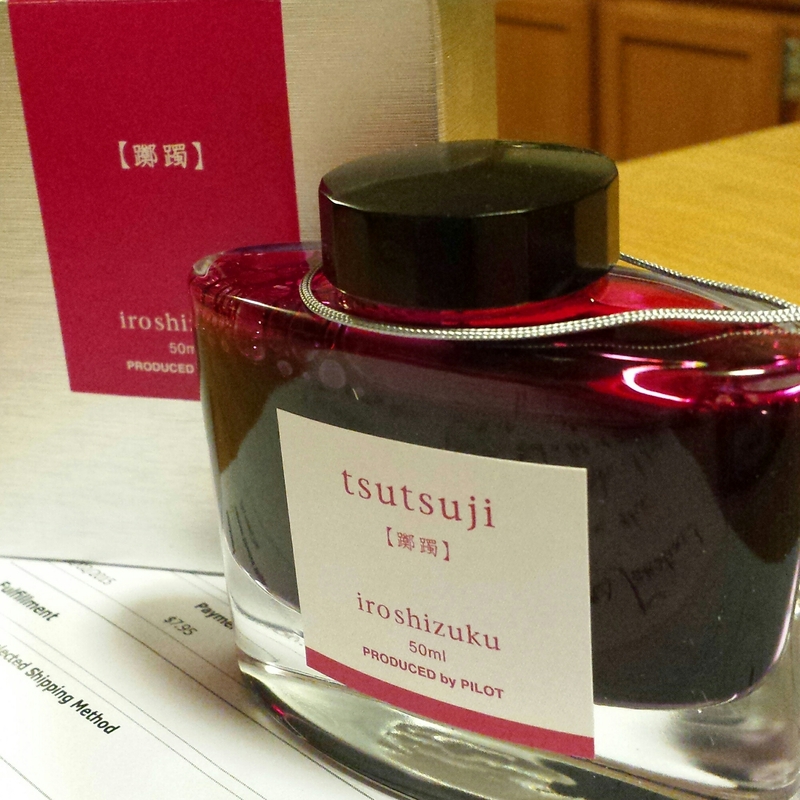 Shown below on some Tomoe River Paper samples an awesome pen friend sent my way. I am in major love with this ink! 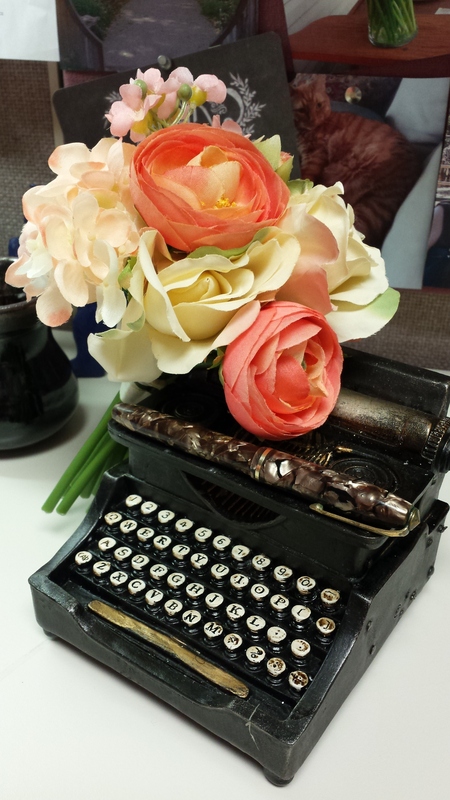 Then of course, had to pose the pen with some new desk accessories I got at Michaels today. 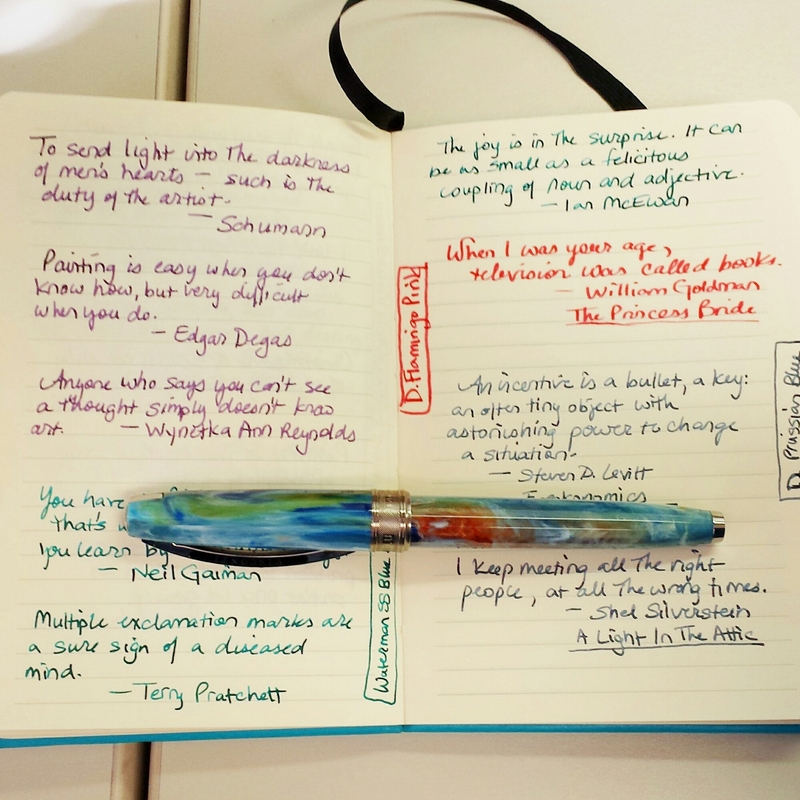 Was updating my Quo Vadis Habana turquoise notebook that I use to jot favorite quotes and stuff like that in, and decided it was a good photo opp. 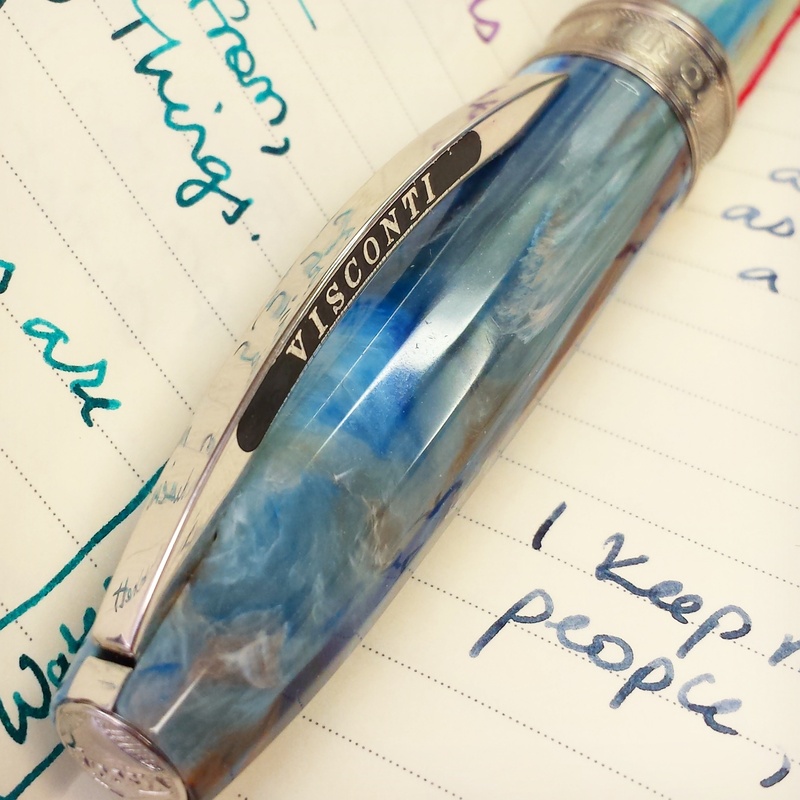 Love this Visconti Van Gogh Portrait in Blue fountain pen. 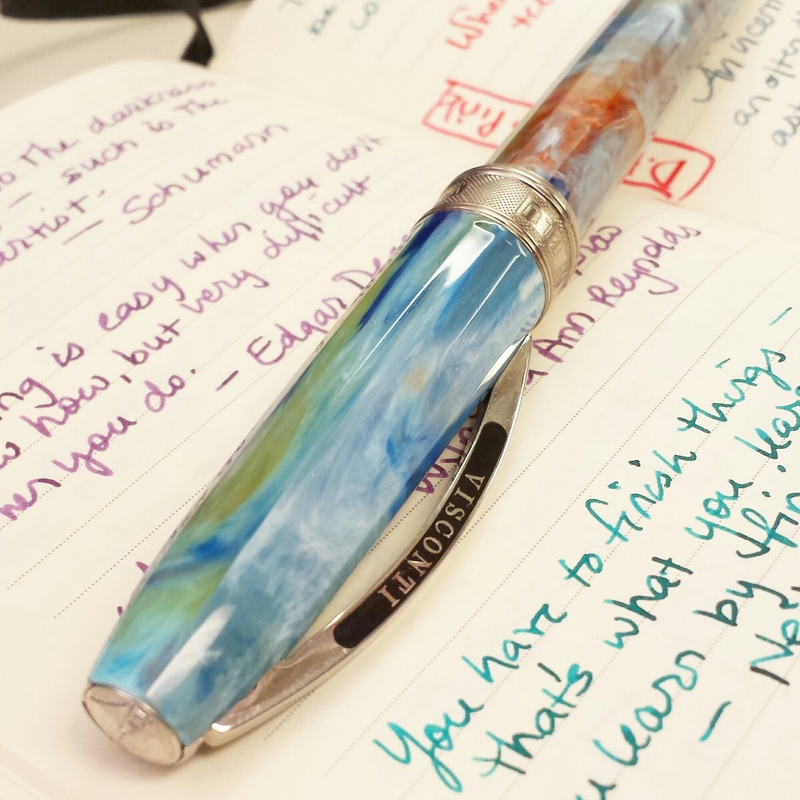 Every week, Goulet Pens offers a #MondayMatchupGiveaway contest on Instagram, where users submit pics of their favorite pen/ink combos, and a winner is randomly chosen. Well, last week I won!! 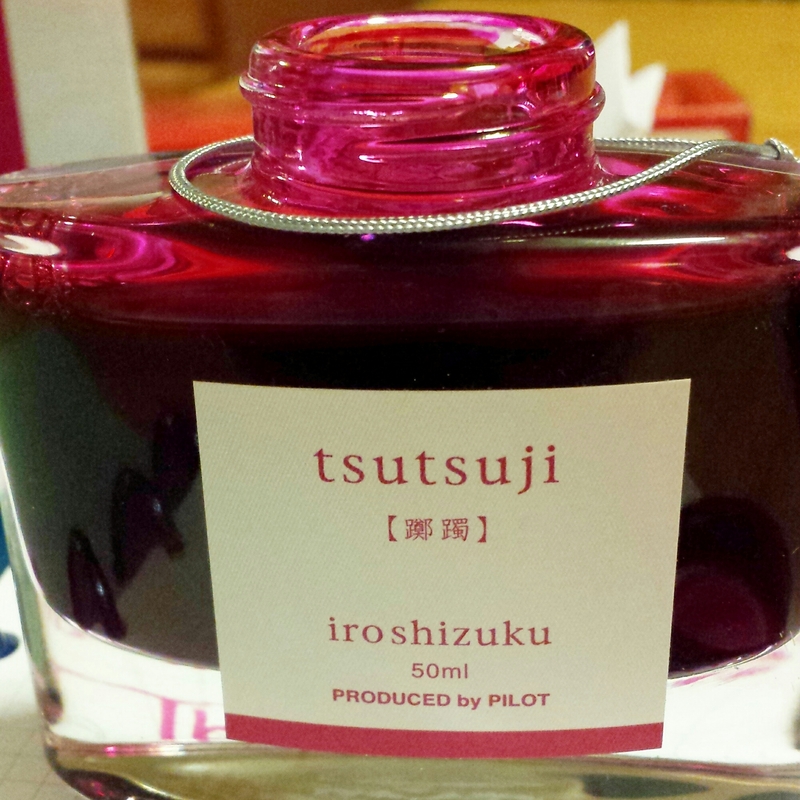 The prize of that week’s giveaway was the Lamy Joy calligraphy pen and a bottle of Iroshizuku Tsutsuji ink. Initially I was more excited to get the ink, as I’d already had tons of experience with Lamy Safaris and even a Lamy 1.5 nib. 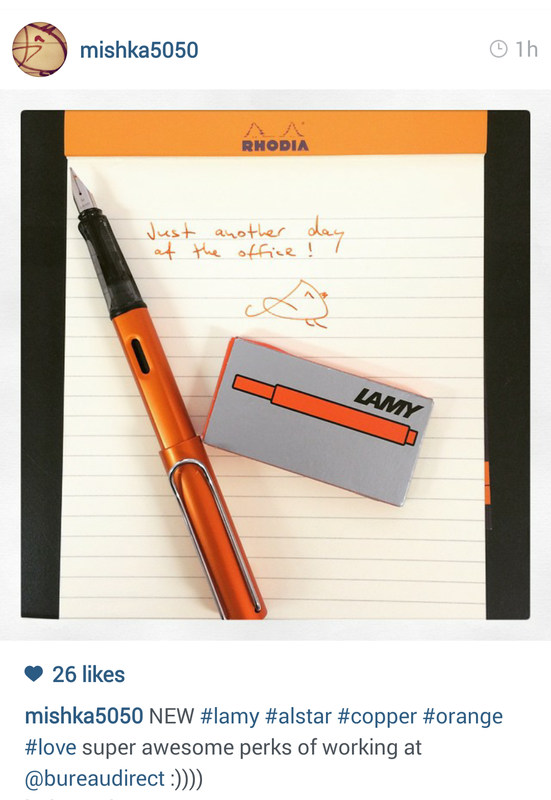 But I actually really like the Lamy Joy. The pen feels like a different animal from the Safari entirely. The balance and feel of it just feels more … special. 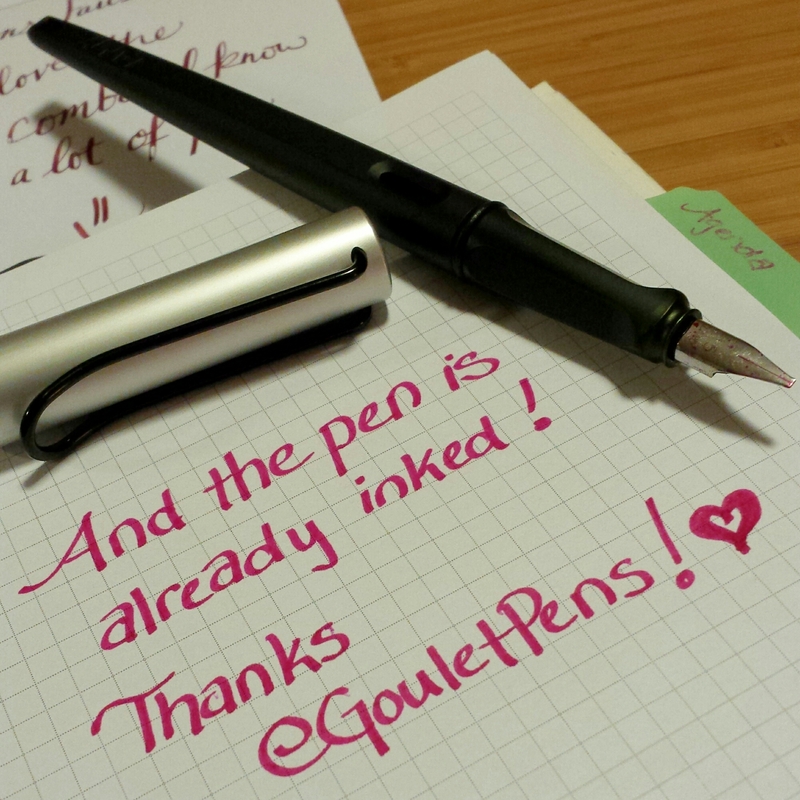 And what’s even better, not only did Goulet Pens ship the pen with a converter, but it came inked too! Look at this glorious color!! It’s a bright pink fuschia with a amazing gold sheen. The bottles really do look like perfume bottles. I love that Goulet Pens always handwrites comments in every packing slip and labels the ink color used. 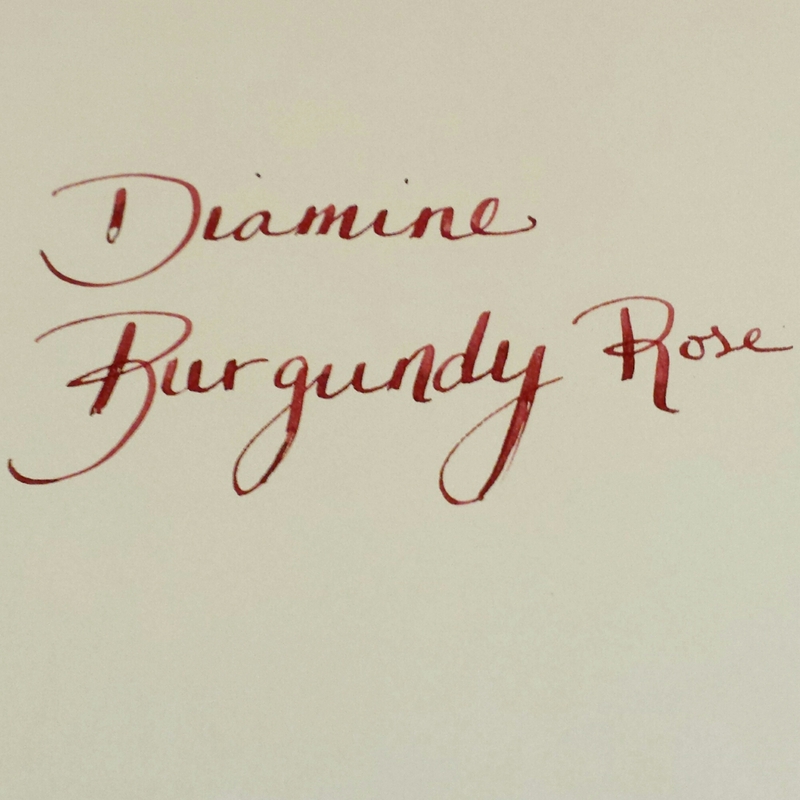 After seeing Madigan’s gorgeous handwriting here, I definitely think I need to get a sample of Diamine Burgundy Rose. 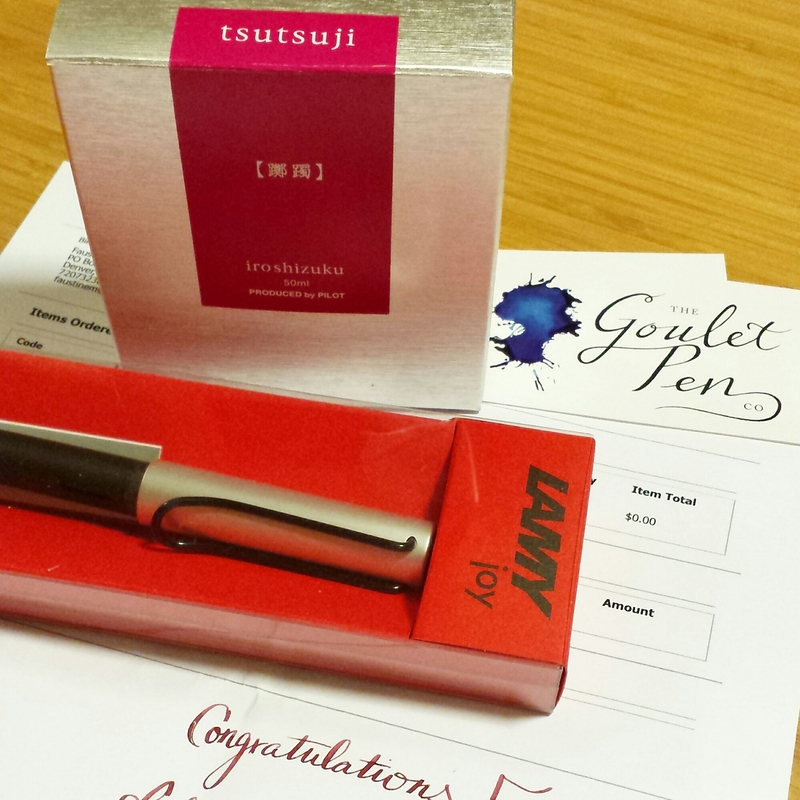 All in all, I’m majorly excited to have won this weekly giveaway from Goulet Pens, thank you soooooo much for both offering this giveaway every week, and for randomly selecting me! 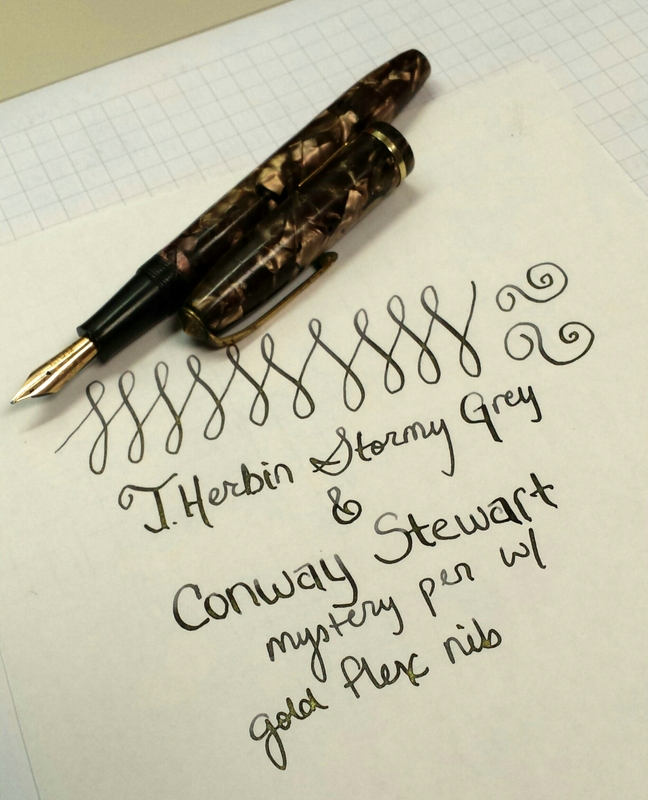 I love this pen/ink combo. I like orange. A LOT. This love for orange is not often understood. To me, it’s bright, happy, warm, more full-flavored than yellow, not as in your face as red. Orange is pretty much the girl next door of the color wheel. 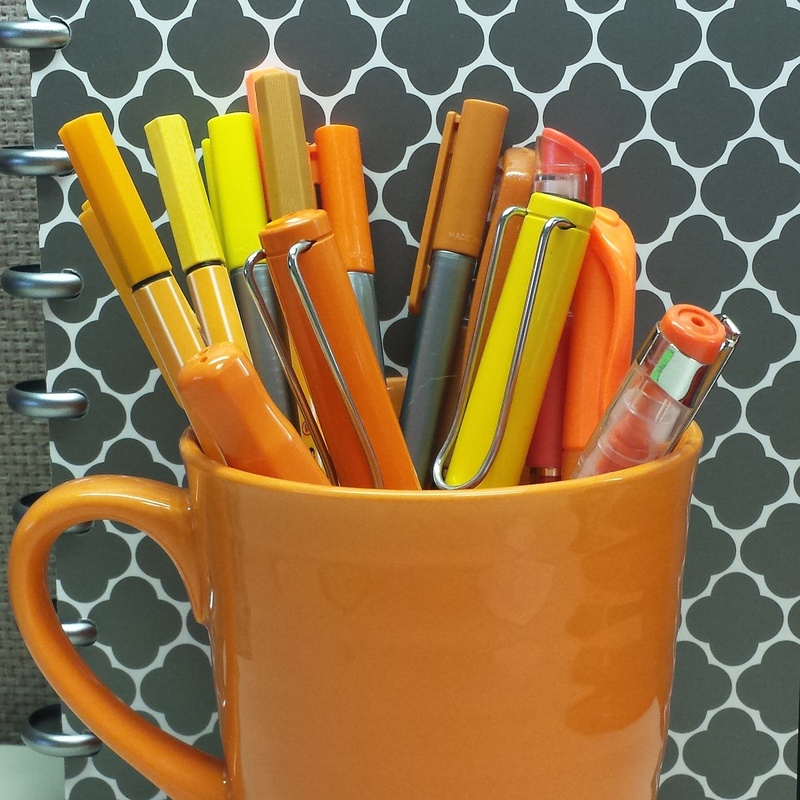 Anyways, I therefore have an addiction to orange office supplies. See what I collected just from stuff on my desk at work not too long ago? Seriously, every time I see this pic I have that ‘Pocketful of Sunshine’ song playing in my head. 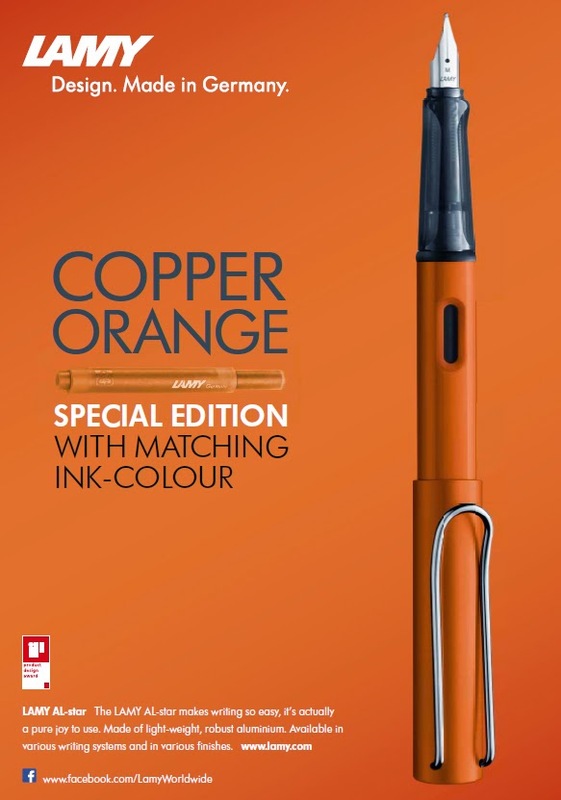 So you can imagine how excited I am to hear that the 2015 Limited Edition Lamy Al-Star color will be copper orange. 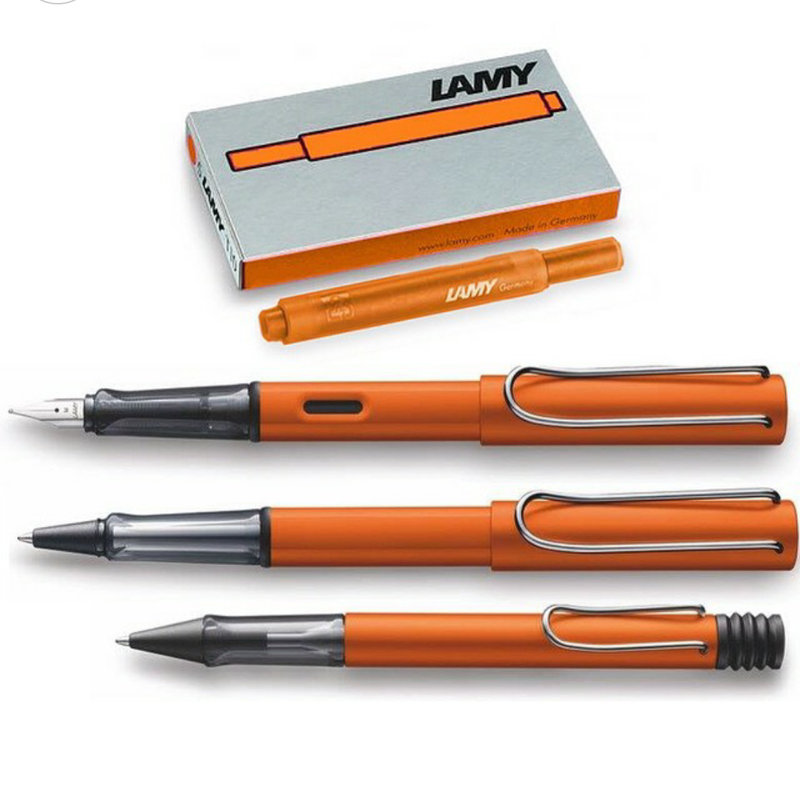 Yes, there are already two versions of orange Lamy Safaris (three if you count the historical Terracotta), but nothing in the Al-Star’s matte aluminum finish. I mean, how AWESOME do these look!?! I SO WANT ONE. 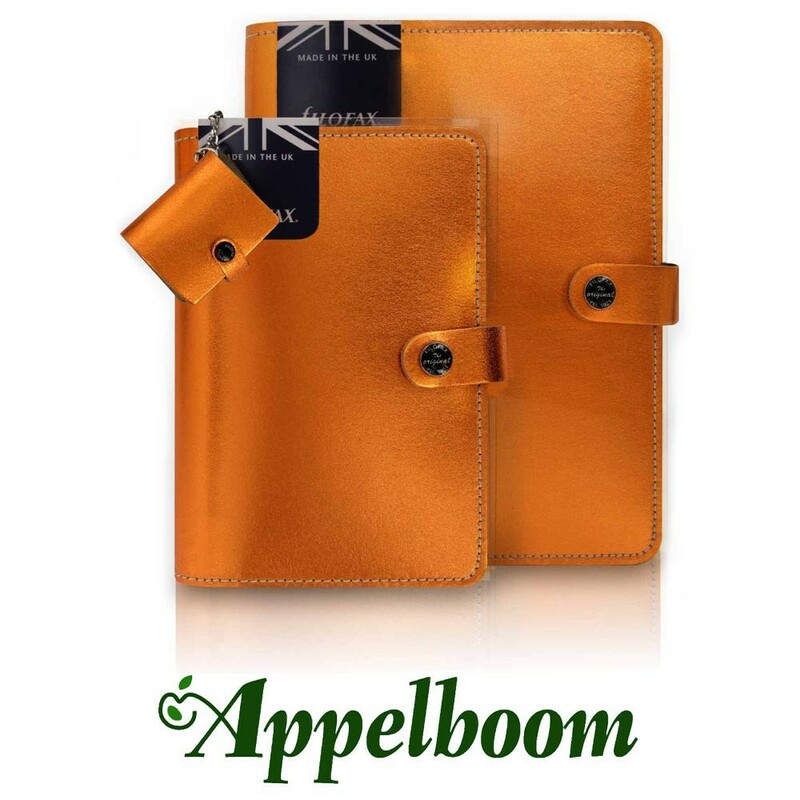 Apparently they are available right now for pre-order from Fontoplumo.nl. 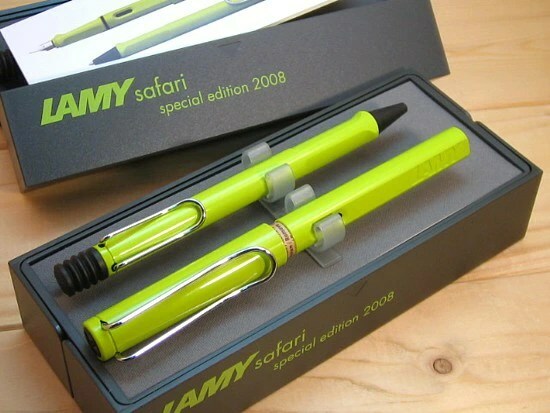 I just wish Lamy would get it’s act together and offer a Limited Edition Safari in the much desired purple. But alas, rumors are that it will be a Neon Green. 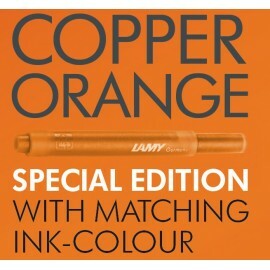 Which… REALLY LAMY?? Yes, I grew to love the Neon Yellow and Coral, but… I have serious doubts. Once inside, we found the staff super helpful and informative, willing to let us try and hold all sorts of fountain pens they had on display. 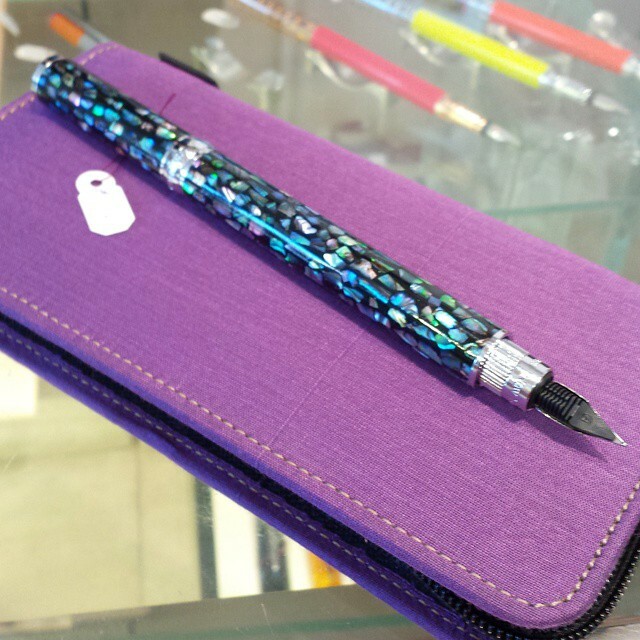 The pen above is shown on a Franklin-Christoph 3-Pen Case in purple silk, which I was also majorly drooling over. 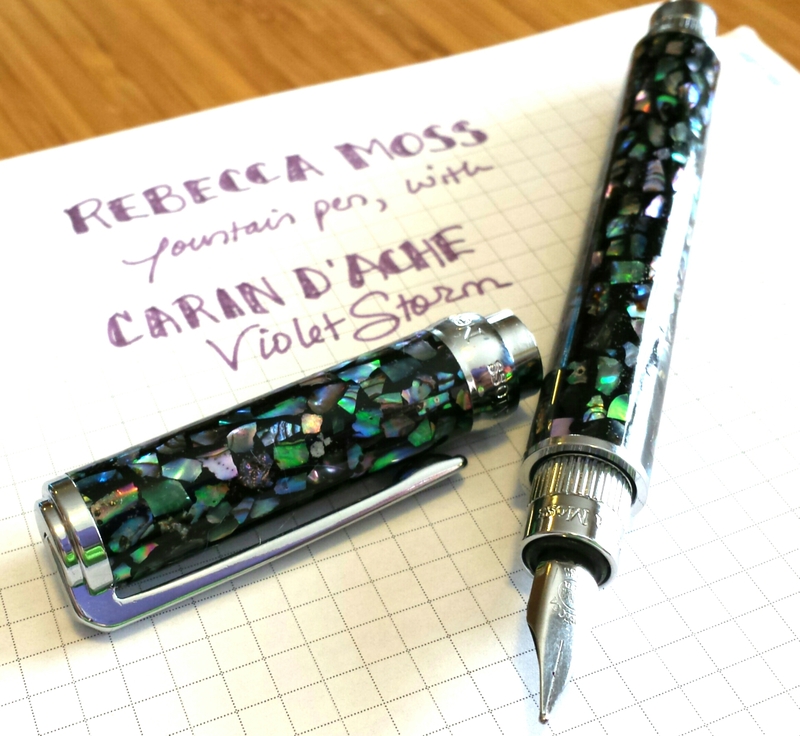 Anyways, the Rebecca Moss pen reminded me a lot of the Retro ’51 Cioppino LE Fountain Pen (another review here), which I’d always loved the finish of, but never liked the style of the Retro fountain pen line. Whereas the Moss pen had a much better and simplified style and look that appealed to me. AND I HAD TO SAY NO. WOE! I mean, we’d literally spent money a few weeks before at the Pen Show, and were currently spending whatever remained while on vacation. 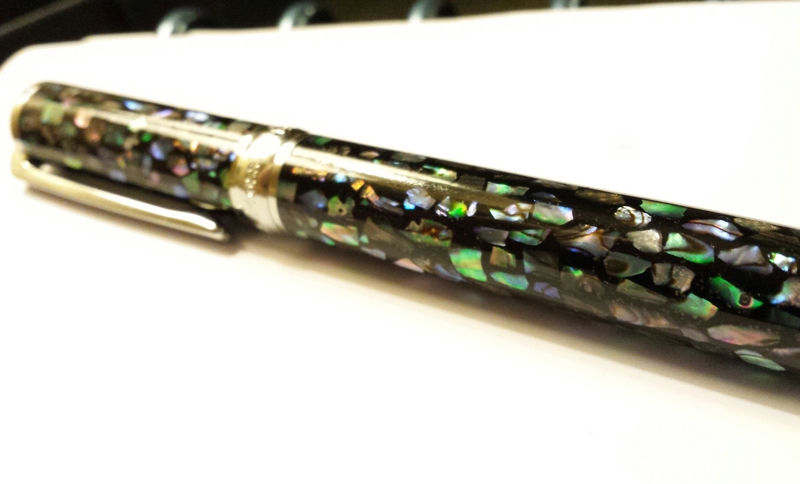 The sales clerk let me play with it and take pics, and said the Rebecca Moss pens were now discontinued so weren’t widely available anywhere else. I left the store with a cheap $30 glass dip pen and some ink instead, but couldn’t stop thinking of it. Once back from vacation, I had to Google Rebecca Moss pens, and discovered there’s really not any info out there on them! 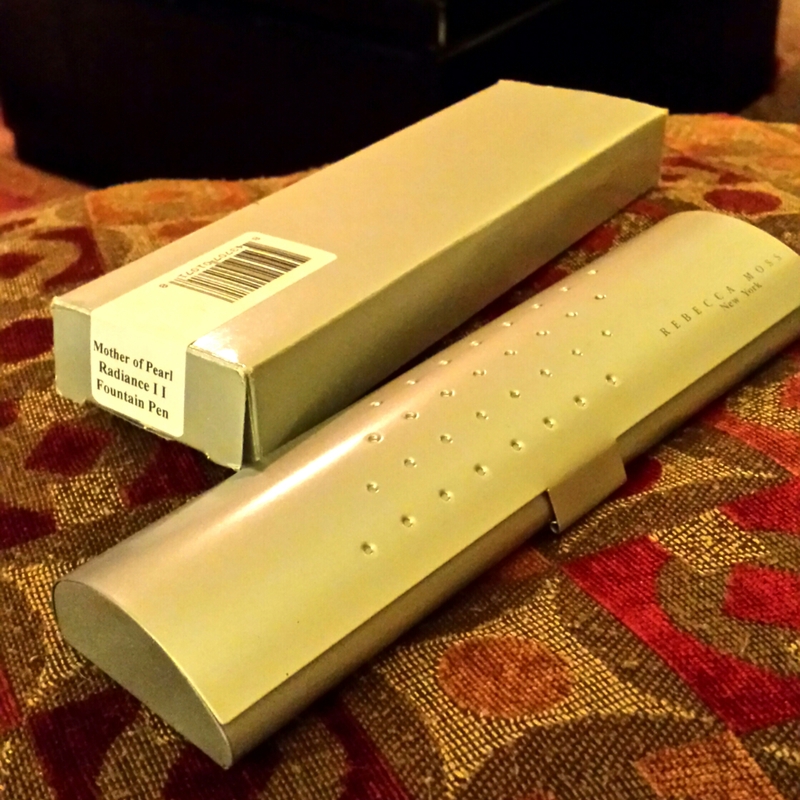 The closest review or blog post or anything I could find was this review of a rollerball pen with the same finish. Even the domain name, http://www.rebeccamoss.com, was now available for sale. I’d been secretly hoping the hubby would buy it and present it to me at Christmas or as some future gift (since I kept going on about it, and he’s good about picking up on those hints haha). 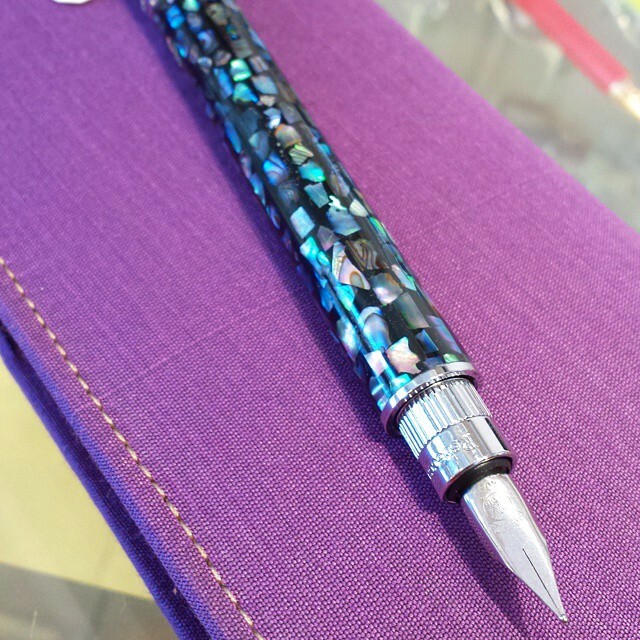 But then one day at he called me up at work, and was all, ‘well, I tried to order it, but the guy at Papier Plume said he’d literally just sold it and shiped it out the week before.’ Apparently someone had seen my pics on Instagram, and sent one it to the store, all ‘I want to buy THIS pen!’. So, that was disappointing news indeed. 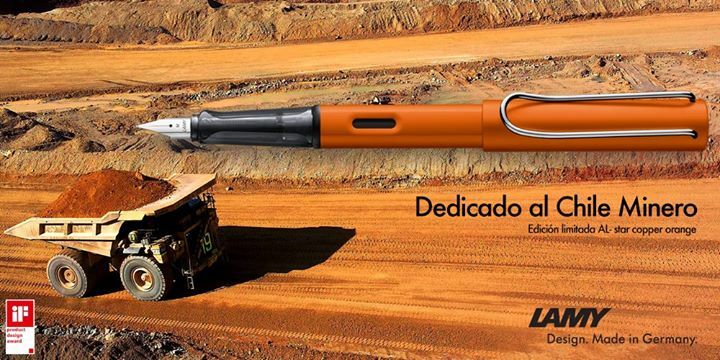 Since by then, even though it was utterly ridiculous, I’d kind of thought of it as “my” dream pen. And then I opened THIS on Christmas morning!! The Christmas pen has a nice hard metal case. 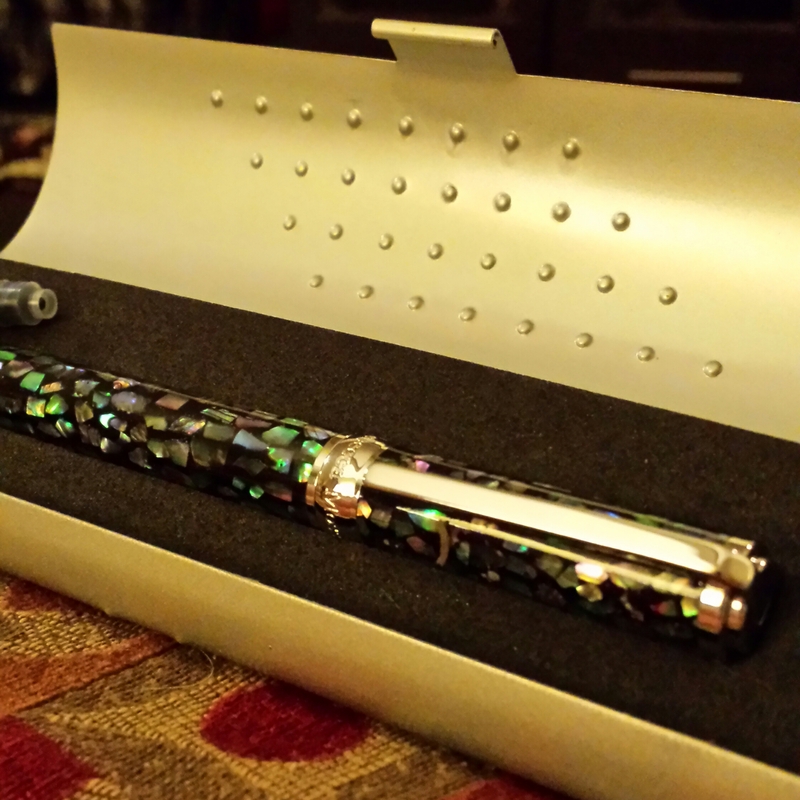 The Rebecca Moss fountain pen!!!! 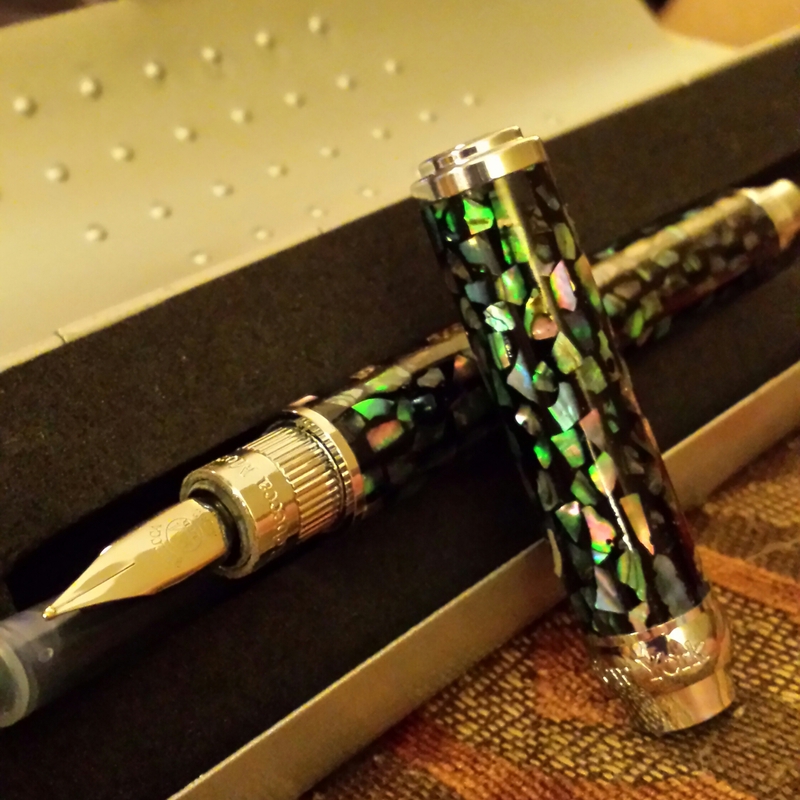 The Rebecca Moss fountain pen. But … HOW!?? Well, my husband, all gleeful about my complete shock, told me that once Papier Plume told him they’d sold the pen we saw, he stayed in contact with them, and that Patrick at the store did some research and contacted his network of fellow pen shop owners, and FOUND ANOTHER now discontinued mother of pearl Rebecca Moss pen at a shop in New York. He had it shipped to NOLA and then my hubby purchased it from there to surprise me on Christmas morning. I am so thankful that Patrick took that extra initiative to help my hubby find this pen, the store doesn’t seem to have any presence on Twitter or Instagram, but maybe they will see this blog post one day. If they do, THANK YOU THANK YOU! 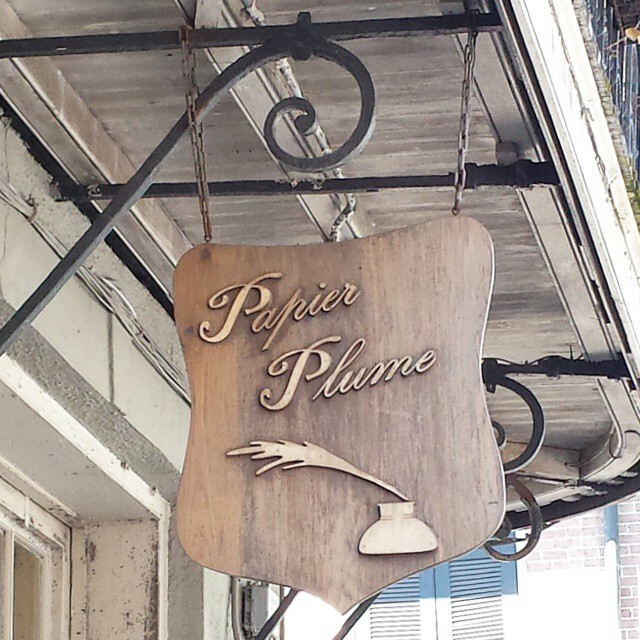 You have earned loyal customers in the both of us, and I can’t wait to visit your store again the next time we are in New Orleans. It writes beautifully too, a nice smooth medium line. Such a beautiful shell finish! 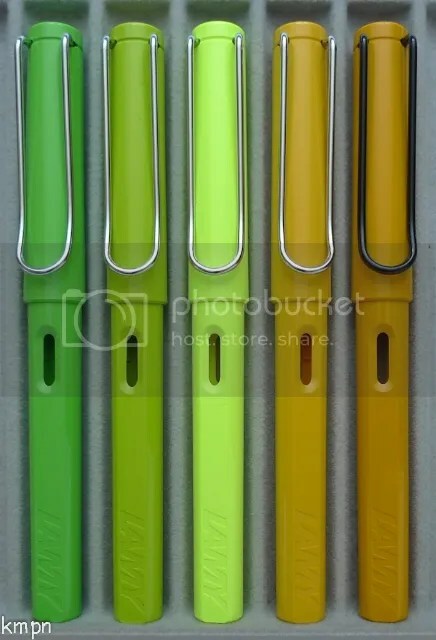 Very rare in fountain pens. The only downside was the inside of the cap was rusting and flaking pretty badly. 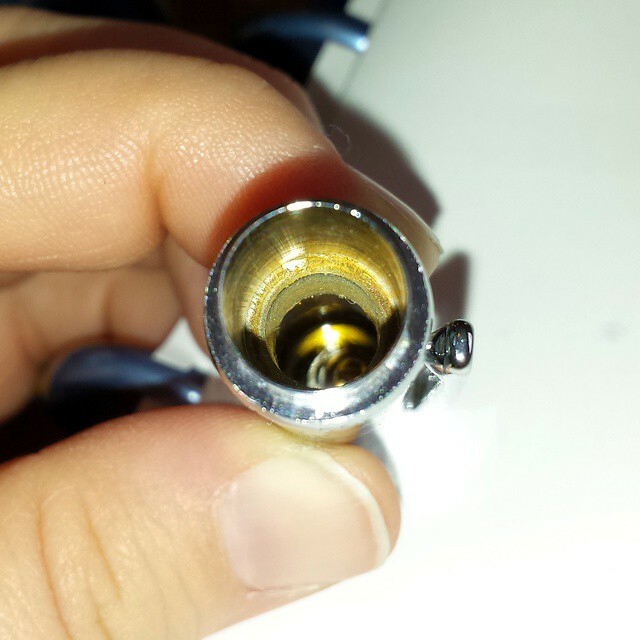 The rusted inside cap of the Rebecca Moss fountain pen. And because the cap was magnetic, the rust and flakes were getting pulled down to the nib section of the pen, where they accumulated every time the pen was capped. So, since the pen was discontinued and Rebecca Moss was no longer around, I wasn’t sure how to replace the cap if needed. So I’d have to see if I could treat or stop the rust somehow, and wondered if clear nail polish would work. 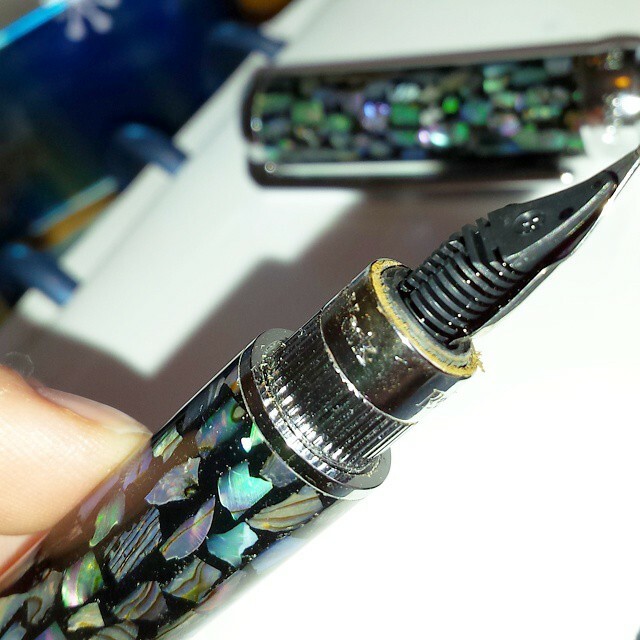 I immediately asked my trusty network of fountain pen geeks on Instagram, and got some sound advice on how to clean the cap first with alcohol and let it dry thoroughly, then either put a couple of coats of clear nail polish on it, or try some mineral oil to stop the rust. Not wanting to risk getting oil on the nib, I decided to try the nail polish method. 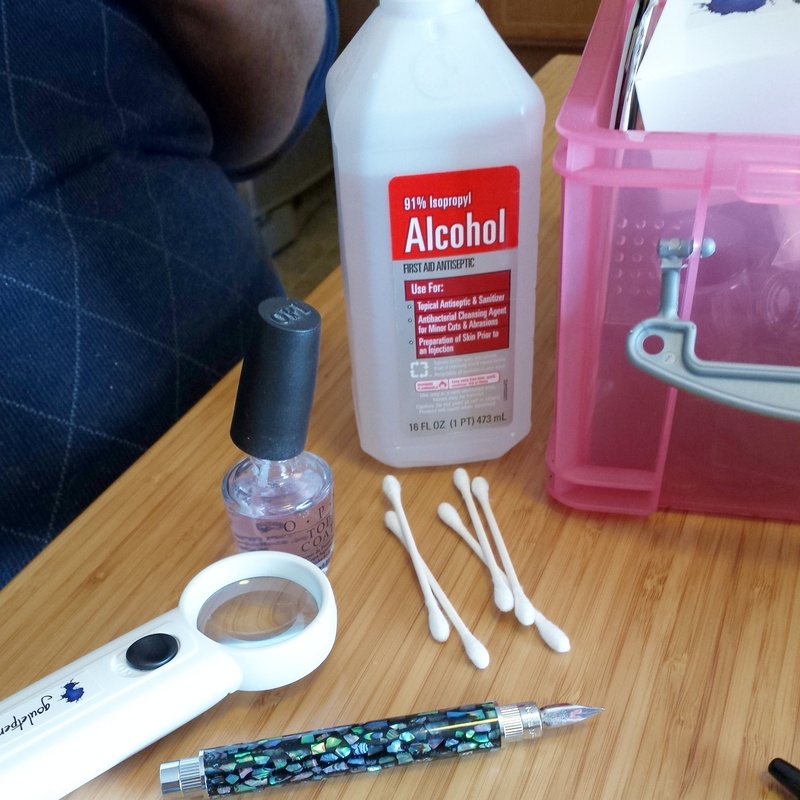 Using Q-Tips and alcohol, we cleaned out all the rusty grodiness from the cap, and put a couple of coats of nail polish around the rusted areas, letting it dry thoroughly. I’m not sure how long it will last, or if I’ll need to reapply in the future, but so far it seems to be working!! I’m just happy it was only the cap that was rusting and not the nib section, which wiped right off and showed no other signs of rust. So yay! 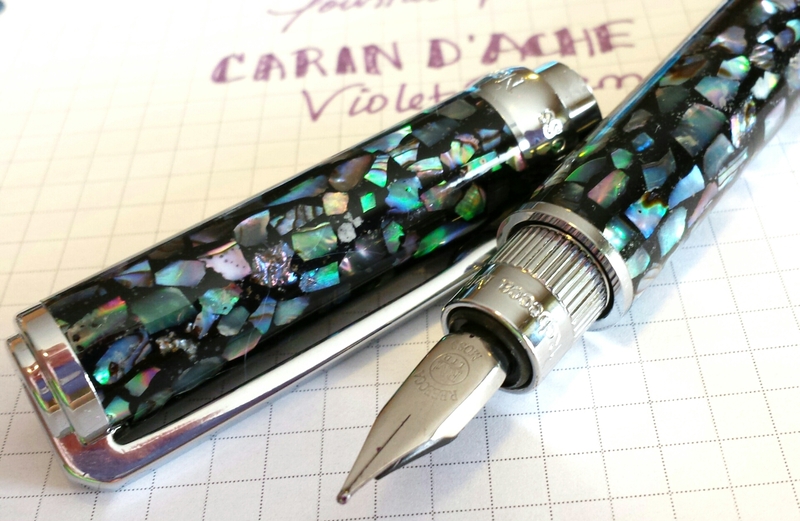 Pen emergency has been resolved, and now I can go back to posting pics of how gorgeous this pen is!